With the ski season starting this weekend, here's a tip and a link for folks heading to Northstar or any other California destinations. During the winter months, the weather in the mountains can be unpredictable and the roads occasionally shut down due to accidents, slippery roads and low visibility. When it's snowing, chain control stations are staffed with friendly agents making sure your vehicle is either a 4 by 4 or has chains on its tires. So before driving in the Sierras or the Lake Tahoe Basin, check the weather and the road conditions. Make sure you have your chains handy, and if you're traveling with the kids, a second movie might be a good thing to pack. (Snow and chain controls can make a long trip considerably longer than usual. 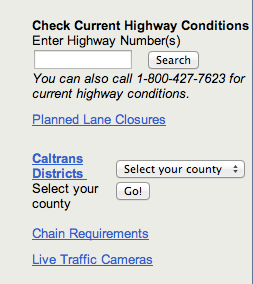 You can find out about the California road conditions here: www.dot.ca.gov or by phone at 800-427-7623. Here's a picture of the road conditions widget which is located on the right side of the page.